For some months I'm wondering what I have to do with Heal. 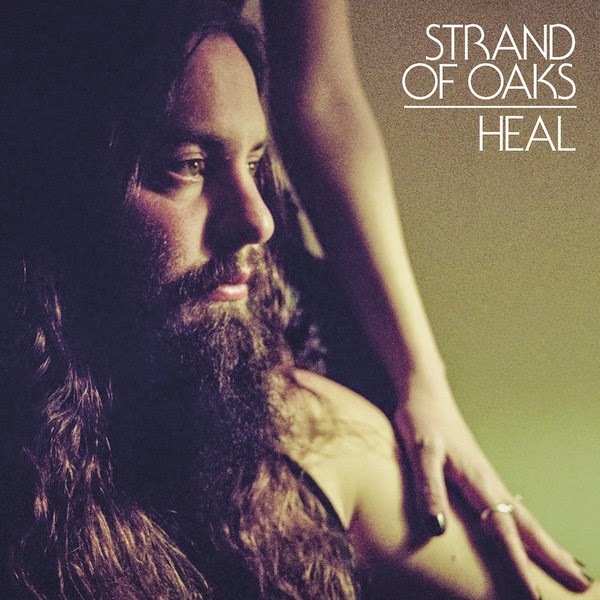 Having gotten to know Strand of Oaks through its 2010 album 'Pope Killdragon' (http://wonomagazine.blogspot.nl/2013/09/pope-killdragon-strand-of-oaks.html), I got the fright of my life listening to opening song 'Goshen '97'. As if Admiral Freebee rejuvenated his 2005 fabulous rock song 'Oh darkness'. Nothing I associated with Strand of Oaks. The electronic, 80s sound of the second song, 'Heal', even made me shy away further. Hence I decided to leave the album alone. Until I put on a bunch of records compiled as MP3 in my record player, without knowing what I was listening to. What happened is that I heard songs that sounded faintly familiar, not guessing, just listening, that certainly had power in them. Not good, not bad, but certainly powerful when played at a modestly loud volume. The 80s rock sound continued with 'Same emotions', sung with a high sounding voice, synths all over the place. In 'Woke up to the light' Strand of Oaks does a Coldplay. Unfortunately one of the 'Viva la vida' variety. The song is dark, with pain in the dark synth sounds and hope in the lyrics for something better. Not a shard of light is let in. Strangely enough I enjoy Heal better on the audio system then on a headset. Usually it is the other way around. The miracle happened later and that is why I'm behind my computer typing away anyway. There's one song on Heal that exceeds all others and qualifies for one of the better songs of 2014. 'JM' sounds like Neil Young sounded on 'On the beach'. That brooding dark album, that happens to be my favourite. A soft playing electric guitar, a few piano notes and Showalter singing and there the sound explodes. Dark, dark sounding guitars, one playing solo notes. A sound so distorted that notes come out as an amalgamation of electronic pulses, as if remnants of far off cosmic explosions. Some notes are just a single crackling noise. Magic! Bass and drums behind that all. And down we go again, but with a menacing sound in the background. A song about exclusion, being alone with someone's "sweet tunes to play". 'JM' explodes again, with that dark veil of despair. A song like Neil Young doesn't write any more for decades or if he does, less successful than 'JM'. The kind of song that I sort of would want to last forever, even if there's one totally off note or two. 'JM' is not 'Like a hurricane', nothing is that, but is a great effort. Long, epic, "like they don't make them any more". Well, have I got news for you, they do.Whatever else I think of Heal, 'JM' makes it worthwhile to listen to the album. The album continues with the dark pop of 'Plymouth'. Again a song that I have difficulty with getting used to. It isn't until 'For me' is unleashed from its shackles that the album veers up again. 'For me' has some electronic sounds in the background, but rocks in the right way. With a fiery guitar solo, double tracked. Loads of dynamics in this song. Again blackness, as "the sun fell right out of the sky". "For me", it sounds soft and small at the end of 'For me', as an afterthought, after all the sound explosions. Torment, pain, despair all fight for attention here. It all ends with 'Wait for love'. If anything the other Neil Young, the piano acoustic one, shines through in the beginning of the song. After that it explodes again, into the dark corners and alleys Timothy Showalter introduces us to on this album. Jesus healing, that's what the cover looks like. It seems like Timothy Showalter was doing just that when finishing this album after a severe crash with his car in the winter of 2013. There certainly is a lot of life in Heal. Not always the sort I'm looking for musically. Heal is an album I don't really know what to think of. The whole confusing career of Neil Young into one album, sort of. It's just not what I'm looking for. And then there is this one song. That special one. 'JM'.